We sometimes have puppies or adult dogs available to go to new homes. All our puppies are raised with love and have wonderful temperaments. Our puppies go to their new homes with a puppy pack to help you care for them. The pack includes all the information on the Poodle Care page plus their own toy, a blanket smelling of home, some food to make the change to a new home easier on delicate tummies, and a copy of the pedigree and other relevant information. Your puppy up until now has had his/her brothers and sisters for comfort and warmth and to play with during the day. When you take him/her home he/she will be in strange surroundings and it will probably take him/her a couple of days to become accustomed to his new home. Your puppy MUST have some toys to play with or he/she could become destructive. Pup chips made of hide to chew. A ball with a bell inside, squeaky toys, soft cuddly toys will keep him/her occupied and away from your slippers and things he could damage. Your puppy must be treated like a new baby` not over handled and over excited. Change of water and change of diet can sometimes cause loose bowel motions which settle down within a day of two. Do not let children overtire the puppy. When his/her bedtime comes, take him/her outside or put him/her on some newspaper to relieve him/herself and when he/she has obliged then place him/her in his/her bed, preferably in a puppy pen. These can be purchased from pet shops or pet wholesale outlets. Your puppy has been raised on newspapers and it is advisable to keep newspaper around his/her bed until he/she is house trained. Young puppies have very little control over their bladder and bowels, and will usually want to relieve themselves as soon as they wake up, after feeding or playing and also at bed times. You should start training from day one. How to housebreak your puppy: before puppy goes to a new home, some training has already been commenced. Puppy is used to using newspaper so it is recommended that you continue with this practice. Place the newspaper in the area you intend for him to sleep: i.e. bathroom or laundry (both areas are easy to clean if accidents happen) When you see your puppy sniffing the floor, gently pick him/her up and place him/her on the paper. Now praise him/her for doing this. As they grow accustomed to using the paper, move the papers closer to the door, and place another set outside. Now, his/her toilet habits will move from spot inside the house to another outside. Once he/she is used to going outside then eliminate the paper inside, leaving only the outside ones. Always give your puppy plenty of praise; during this procedure, like children Poodles like to please. Verbal prompts: Use word association as a way of communicating a thought or idea or action with your pet. For instance, if you want him/her to head for the paper, say “Outside” to him/her a few times until he/she is able to link the word and action in his/her mind. 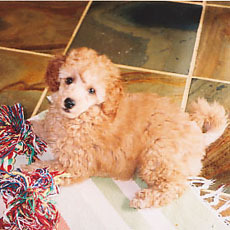 Such verbal cues will go a long way in housebreaking your poodle. Should an accident happen: unless you see him/her defecating or urinating where he/she shouldn’t have, he/she didn’t do it. So, you cannot punish him/her for it. And you are to blame to a certain extent, for if you had been more alert you would have seen your puppy running around in circles with his/her nose down smelling for the perfect spot to urinate in. Feeding and housebreaking: By now, you will notice that every time they wake up and about 40 minutes after a meal, your pup will need to go outside to relieve him/herself. If you are consistent with feeding, he/she will be equally set in a routine to relieve him/herself. Spontaneous urination: When excited, puppies may urinate. Either they spot you for the first time, or meet a new dog or are scared. This is called submissive or excitement urination. This cannot be controlled so don’t discipline or punish your pup for this. Instead, take it in your stride by just getting down to your knees and cleaning up the mess. If you do, he/she may outgrow this by the time he/she is about seven months old. Do not punish for accidents indoors unless you catch him/her in the act. When he/she has performed correctly, give him/her LOTS OF PRAISE and he/she will soon learn what is required from him/her. Puppies will make mistakes, but persevere - it will be worth the effort in the long run. Basic training s uch as sit, stay and coming to call, can start at 8 to 10 weeks old. Do not make lessons to long, or the pup will get bored, try to make the lessons fun. Dog training classes usually start at 4 to 5 months. Recommended reading , DOG TRAINING MADE EASY by Michael Tucker. Dogs are pack animals, and will be much happier if properly trained, and integrated into the family. Check to see if your Vet holds Puppy Classes (most of them now provide this service) It is invaluable in the Socializing of your pet and gets them used to other dogs, so when you take them out they do not mind other dogs. This is a good source of protein and calcium for puppies, however, in excess it may cause diarrhea. If milk is suspected as a cause of diarrhea, it should be cut out of the diet altogether, or diluted by half with water for a few days. Such as rusks, Wheat-Bix or toast are sources of energy for growing puppies. May be fed raw oar cooked, excess fat should be avoided. Meat is an important source of protein, but on its own is not a complete food. Commercial varieties especially for puppies are available, these are formulated as COMPLETE diets, eg; Hills Science Diet (Canine Growth Formula) Eukanuba (Puppy), Supercoat (Puppy), Pal Professional (Puppy), Eagle Pack for small dogs, however, these can get boring if fed on their own. Are a good supplementary food for puppies, they should be fed cooked or finely chopped. Never feed onion to a dog. Are a very good source of fat free carbohydrates, which helps to give that extra burst of energy for growing puppies and dogs of all ages. I believe that some pasta or rice should be included in every dogs daily diet. This presents few problems, usually puppies go off their feed for the first day or two due to changing surroundings and a change of diet or water. 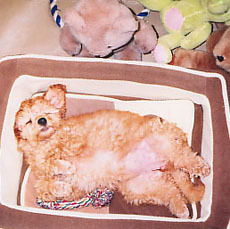 Young puppies have small stomachs, and so need to be fed more frequently than an adult dog. Puppies should be fed as much as they will eat in 10 minutes at each meal, three times a day until 6 months old, and then twice a day until 12 months old. From 12 months of age, one meal a day should be sufficient. Your puppy has been raised on Di-Vetelact formula, Goats Milk (Never use Full Cream Milk as this often causes diarrhea in young Puppies) I rarely find the need to give my puppies milk after the age of six weeks as they are raised on a balanced diet and I don’t believe that they require milk in their diet from then on. However this can be your personal choice as the whether you offer it or not. Your puppy has been mainly fed on EAGLE PACK FOR SMALL DOGS - this is a dry food, that contains all the nutrition that a growing puppy needs. You may purchase this food from myself for from CC Enterprises, Battersea Road, Canning Vale. Brown can - Beef and vegetables. Calcium is essential for growing bones, puppies grow very rapidly. If a pup is getting a balanced diet, it should provide the full range of vitamins. To ensure this is so, feed a balanced diet of quality food and there should be no need to supplement the puppies diet with either calcium or vitamins. Helps exercise teeth, raw large marrow bones are best, NEVER feed cooked bones of any kind, as these may splinter and get caught in the dogs throat or intestines. The main meal can be varied with vegetables, rice and pasta. Dogs love raw chicken necks or wings and these should be included in their diet. I give mine raw chicken wings or necks which they can chew completely, bones and all, as raw bones are soft and easy to digest. Canned food is given as well, so that in an emergency if you run out of home cooked food or are away on holidays you can feed him/her canned meat. Don’t feed cooked chop, steak, fish, rabbit or chicken bones. Raw brisket bones and chicken wings or necks are recommended for healthy teeth and bones. Don’t put vitamin drops, worm syrup etc. on the dogs food. Always feed separately. It doesn’t hurt to put tablets into a piece of cheese. Do leave fresh clean water for pup at all times. Do be sure to continue the worming programme and distemper etc. boosters are carried out - consult your Vet about this. Avoid getting your puppy into the habit of begging by always placing all treats as well as meals in the pets bowl. This helps to reinforce in his/her mind that any food they receive will be found in that place. Get your puppy accustomed to riding in the car. Start off with short trips and gradually work yup to the longer ones, NEVER leave a dog in a car on a HOT day. When disciplining your pet, NEVER call him/her to you to be punished. Get up and go over to him/her. The puppy will be much more willing top respond to the “come” command if he/she associates it with affection. Verbal Punishment - Strong NO and eye contact. If chewing on furniture, shoes etc. then NO!, eye contact substitute object with a toy that he/she is allowed to play with. Take the puppy outside - after sleeping - after eating - after heavy play - when restless - go out to the same spot in the yard with pup and PRAISE heavily when he/she has gone to the toilet.